The good news is that many of us will live to be over 100 years old. The challenge will be–and already is–preparing ourselves for new jobs as technology advances and markets change. This requires workforce training and education on a massive scale. As individuals, we need to continuously develop relevant skills and expertise, build our networks and relationships, and assess our priorities as we look ahead to longer lives in a dynamic world. In the meantime, there are and will be painful disruptions for individuals, families and countries. That was my takeaway from thrilling, fast-paced conversations among innovative, creative thought leaders at last week’s summit convened by The Economist. 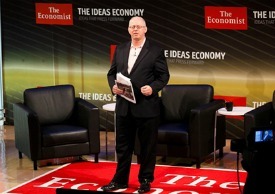 The second annual “Ideas Economy: Human Potential” was chaired by Matthew Bishop (pictured right), U.S. Business Editor and New York Bureau Chief, and Adrian Wooldridge, Management Editor and Schumpeter Columnist, The Economist. “We are at the cusp of a revolution in medicine and biotechnology that will radically increase not just our life spans but also, and more importantly, our health spans.” said Sonia Arrison, author of 100 Plus: How The Coming Age Of Longevity Will Change Everything, From Careers And Relationships To Family And Faith. More good news: Education and training will no longer be limited to the few. The internet will throw open the doors of opportunity to people in every corner of the world. “This is not futuristic. You can see this happening now. It is quite tangible,” according to Tyler Cowen (pictured below), Professor of Economics, George Mason University, whose most recent book is The Great Stagnation: How America Ate All The Low-Hanging Fruit of Modern History, Got Sick, And Will (Eventually) Feel Better. Shai Reshef discussed University of the People, which he recently founded as the world’s first tuition-free online university dedicated to the global advancement and democratization of higher education. “Already, over a thousand students from 119 countries are enrolled in degree programs for business administration and computer science,” said Reshef, who told me afterward that professors from top academies volunteer as faculty, and that they are planning for 10,000 students by 2015. University of the People partners with New York University, Yale Law School, Hewlett-Packard, and others. Advocating for the value of online education, Angel Cabrera told us that he takes issue with those who are concerned that online education will dilute quality. In fact, says Cabrera, “online eucation can dramatically improve quality.” Cabrera is President of Thunderbird School of Global Management that was ranked #1 Best in International Business Full-Time MBA by The Financial Times 2011 for the fifth consecutive year, and #1 by U.S. News and World Report 2012 for the sixteenth consecutive year; the list goes on. “The traditional campus, centered around large lecture halls, will have to reinvent itself.” Thunderbird offers a variety of educational models, including distance-learning. “Online education will move from the add-on to the centerpiece,” Cowen told me. “Higher education will move towards a hybrid approach with top faculty teaching online, and motivational coaches working with students on a personal level.” Cowen sees the hybrid model making college education more affordable. He envisions new job opportunities in statistics, search, programming, and logic, “since you need people behind smart machines.” Cowen also envisions job growth in the motivational sector. Addressing the audience on personal preparation for successful careers for the longer term, Lynda Gratton, Professor, London Business School, stressed the importance of mastering a skill or talent that you can develop with great depth and the value of social capital and social networks. Gratton’s book The Shift: The Future Of Work Is Already Here provides outstanding expertise and guidance. Tony Hsieh, CEO of Zappos, advises companies to concern themselves with making employees happy as well as customers. “By creating a vision with a higher purpose, you can generate greater revenues in the longer term,” said Hsieh, author of Delivering Happiness: A Path To Profits, Passion, And Purpose. In contemplating a long life with many more years of work, I can certainly imagine that most people will prefer to work in a positive environment with people whose values they share. These are a just a few highlights from the extraordinary speakers and ideas curated by Bishop, who co-authored Philanthrocapitalism: How The Rich Can Save The World, and The Road From Ruin: How To Revive Capitalism And Put America Back On Top with Michael Green. Embedded in this post are links to books to fulfill your further curiosity. Please share your comments below as well.